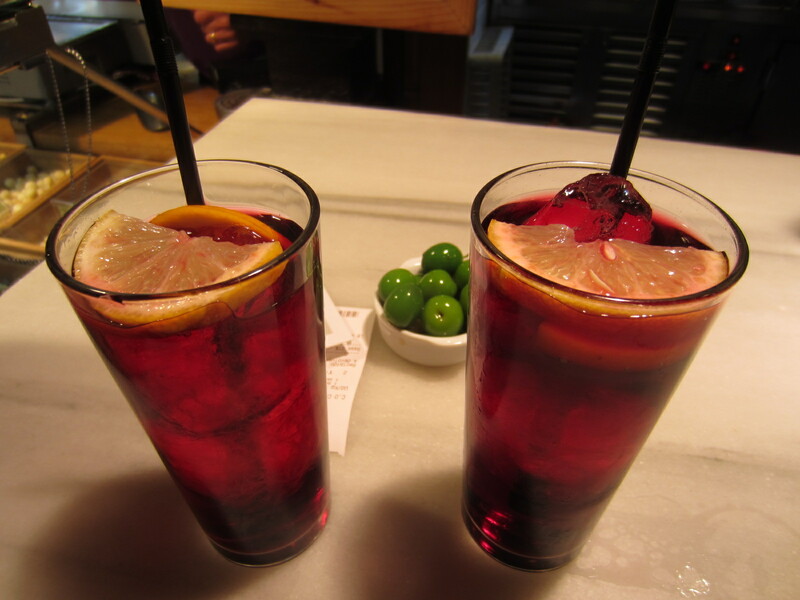 You should know that in Madrid, most bars will give you a free tapa with your beverage, so order a drink and wait to see what accompanies it before you order any food. At La Dolores this was a bowl of salty potato chips that paired perfectly with una cerveza or in my case tinto de verano – a combination of red wine and seltzer water or a lemon soda like Sprite or Fanta – which was recommended by our bartender. This place has the feeling of a neighborhood bar, a cozy wooden interior with small tables close together and no nonsense bartenders. You get a sense that you’re among locals enjoying a bite with friends. Also on Calle de Jesús, La Daniela is a traditional taberna with a more expansive menu of regional dishes (there are 3 other locations throughout Madrid too). 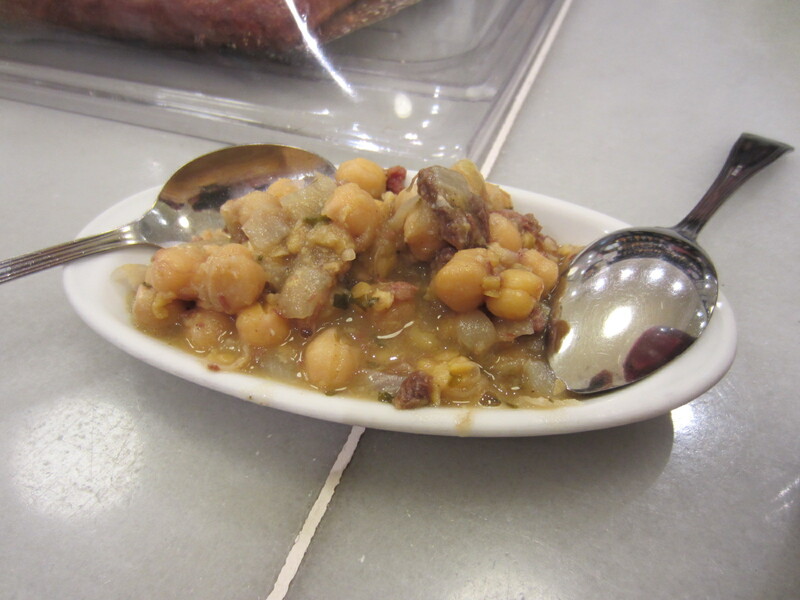 If you want to experience authentic Madrid cuisine, a must-try is their chickpea-based stew cocido madrileño. It’s one of Madrid’s most famous dishes and at La Daniela, the soup was served along with our beverages (remember the free tapa trick?). It was also here that I began my Spanish love affair with a particular tapa of brie and caramelized onions served warm over a piece of crusty bread. Between the delicious food and the extremely friendly service, we had such a good experience at La Daniela that we went back twice. One of Ernest Hemingway’s old haunts, when you step inside La Venencia it’s like you’re stepping back in time to the days when the literary master himself would belly up to the long wooden bar. It feels so well preserved (whether intentional or not) – with a worn, musty interior, old bullfighting posters on the wall and rows of dusty bottles behind the bar – as if Don Ernesto’s last visit was yesterday. 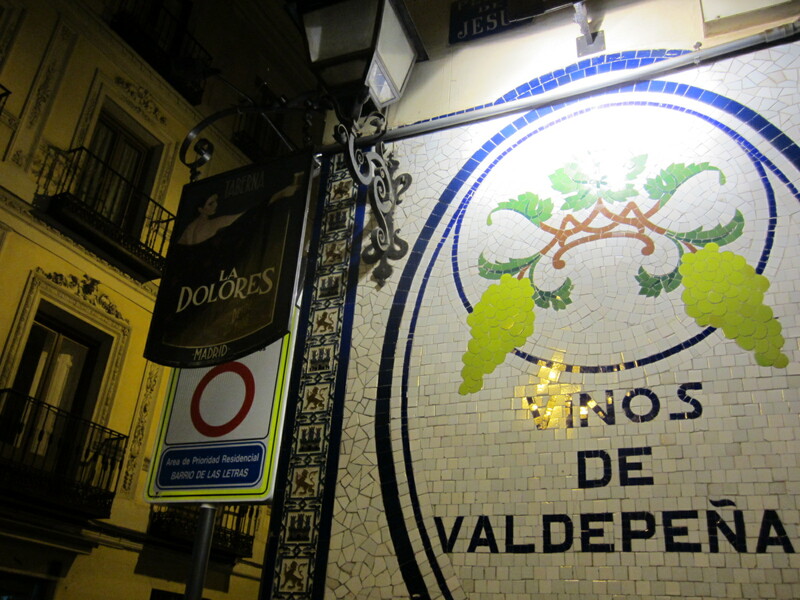 La Venencia is about as central as it gets in Madrid, yet it feels off the beaten path, down a dimly lit street with few other business or people and discrete signage. 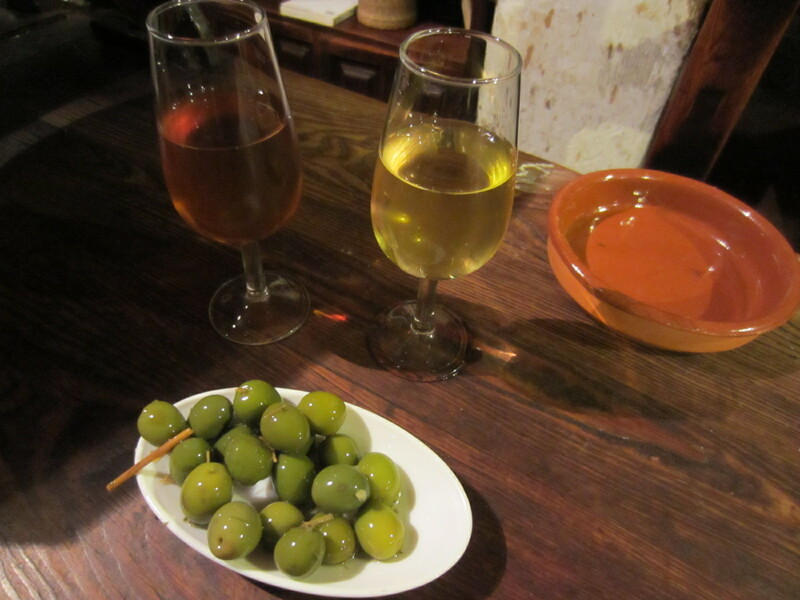 When you step up to the bar, don’t order your “usual” because they only serve one thing, sherry or jerez as it’s called locally. And if you ask for anything else, the bartender will point to the small list of 4 or so varieties behind the bar. After making your selection, you’ll be left with a bowl of olives as you sip your sherry. It’s not for the faint of heart, that’s for sure. The bartender keeps track of your tab with chalk tick marks on the bar, and after you’ve settled up (they won’t accept tips), he’ll wipe the slate clean as you go on your way. Dating back to 1894, don’t dismiss this bakery just because of its location right off of the tourist-filled Puerta del Sol. Fight passed the crowds gathered in front of the beautiful window display of chocolates, cookies and pastries, including La Mallorquina’s signature napolitanas. Available in both crema and chocolate varieties, this is a must-try especially if you are lucky to get one warm out of the oven. Enjoy your pastry standing at the bar with un café solo or find a table in the quieter room upstairs with views overlooking the square. Some of my favorite food experiences tend to take place at local markets, and the centrally-located Mercado de San Miguel was no exception. 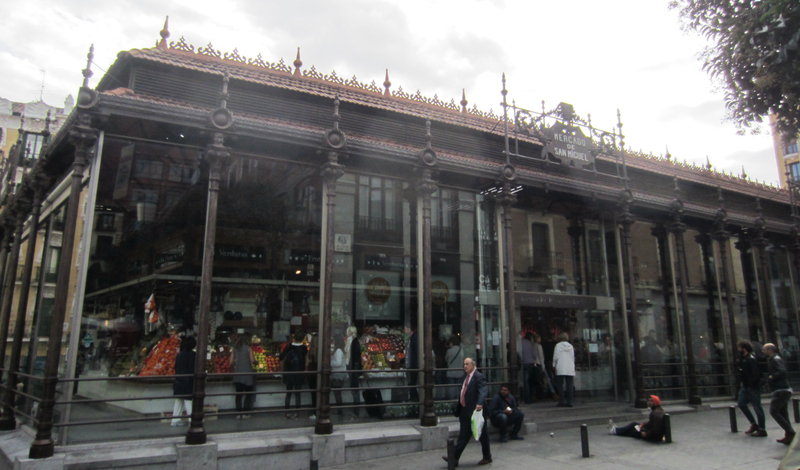 The beautiful glass building with distinctive ironwork was originally the site of an outdoor market before officially opening in its covered form in 1916, making it one of the oldest markets in Madrid. More gourmet than other markets like La Bouqueria in Barcelona, San Miguel is a gastronomic delight with specialty stalls flanking the perimeter – from meats and fish to cheese, produce, nuts, pastries, pasta, wine and larger bites like traditional tapas and paella – and tables filling the middle. The market attracts a lot of tourists, but it’s a great place for a casual meal with a side of people watching, or in our case, a daily 2pm Sangria ritual at The Sherry Corner (stall number 21 on the north side of the market). What’s even better is that San Miguel stays open late, until midnight during the week and 2pm on Thursday through Saturday, so your libations can carry into the night. For more food and drink recommendations check out EATS: Madrid – Vol. 2. You found some great places! We love La Venencia! Thank you! That’s quite the compliment coming from you!